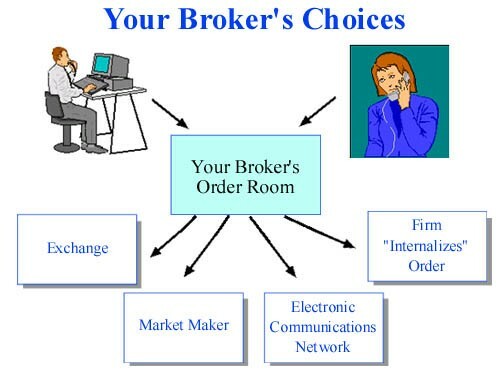 Many investors who trade through online brokerage accounts assume they have a direct connection to the securities markets. But they don't. When you push that enter key, your order is sent over the Internet to your broker - who in turn decides which market to send it to for execution. A similar process occurs when you call your broker to place a trade. For a stock that is listed on an exchange, such as the New York Stock Exchange (NYSE), your broker may direct the order to that exchange, to another exchange (such as a regional exchange), or to a firm called a "third market maker." A "third market maker" is a firm that stands ready to buy or sell a stock listed on an exchange at publicly quoted prices. As a way to attract orders from brokers, some regional exchanges or third market makers will pay your broker for routing your order to that exchange or market maker - perhaps a penny or more per share for your order. This is called "payment for order flow." With this information readily available, you can learn where and how your firm executes its customers' orders and what steps it takes to assure best execution. Ask your broker about the firm's policies on payment for order flow, internalization, or other routing practices - or look for that information in your new account agreement. You can also write to your broker to find out the nature and source of any payment for order flow it may have received for a particular order.